This piece originally ran two years ago. It's worth a re-read as your homeschool friends head back into another school year. "Oh, you homeschool your kids? You must be so organized. I wish I could do that, but I don't have the patience." It is something every homeschooling parent has heard at one time or another. I don't know how other parents react, but when someone says it to me I usually smile and gently correct the misconception: no, I'm really not that patient, nor am I particularly organized, but I believe in what we're doing so we muddle through the best we can. I first started homeschooling my children in 1999. At the time it was less common than it is now, but widespread enough that I have never experienced the extreme level of suspicion directed at some of my friends who started even longer ago than I did. Instead, I think the feeling with which I am most familiar as a homeschooling mom is isolation. The isolation is both physical, as the constant presence of children strictly limits a homeschool mom's freedom, and mental, as homeschoolers are still very much a fringe group. Even as homeschooling has become more common, homeschoolers remain the oddballs walking around town with their school-age kids at 10:00 a.m. on a Tuesday. We're the ones who may live in a top-notch school district or attend a church with a day school but who, perplexingly to some, choose to teach our children at home. We're the ones you may find still in pajamas at noon not because we're living a life of leisure but because adequate time for personal grooming can sometimes be hard to come by. Being among other homeschoolers does not necessarily decrease the sense of isolation; on the contrary, it may sometimes accentuate it. One would think a homeschooler would feel most at ease with fellow homeschoolers. But there is a vast range of homeschooling philosophies and approaches, and those who have chosen one of those approaches as the organizing principle for a large segment of their lives are bound to be passionate about it. In discussions with one another homeschoolers, like anyone else, sometimes fail to put the best construction on each other's words and actions. Misunderstandings happen, feelings get hurt, and defensive walls go up among those who ought to be most supportive and understanding of one another. In our continuing series on friendship here at SDMW, we have been looking at ways that we can be better friends to our sisters in the faith. 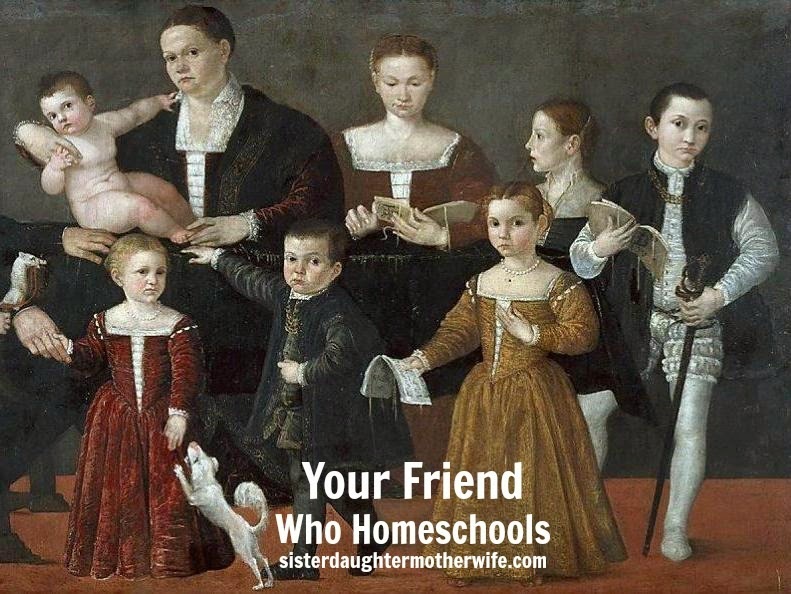 Like anyone else, we homeschooling moms need friends, but finding them is not easy. We aren't running into other moms as we drop our children off at school in the morning or volunteer in the school office. We don't have full-time careers or day jobs that afford opportunities for office-based friendships. We find it hard even to get away to meet a friend for a cup of coffee. Often our best friends are in our computer, which means we rarely get to see them. So when we find a flesh-and-blood friend who seems to "get" this thing known as homeschooling (or who at least wants to), we prize her like a discovered treasure. If you know someone who homeschools and would like either to understand her better or to overtly support her as a homeschooler, here are some suggestions for consideration. 1) First, please keep in mind that even as homeschooling has become more mainstream, most homeschoolers have at one time or another experienced questioning, suspicion, or downright condemnation for their choice to homeschool. As homeschoolers we know we are seen as different, and we understand that sometimes questions are just that--questions. But at other times opprobrium masquerades as curiosity. Bear with us if we are not in the mood to answer all your homeschooling questions. When you meet someone whose child is in public school, do you routinely ask her why she made that choice; how she knows the child is learning everything he needs to learn; and oh, yes, what about socialization? All of these questions could legitimately be asked of a traditional schooler, but they usually aren’t. It can be tiring as a homeschooler to have to repeatedly defend our parenting choice in the area of education. We deeply appreciate those who don’t make us do so. 2) On the other hand, as homeschoolers we also don't like to feel as though we are being put on some sort of pedestal. We are not supermoms in crisp white aprons, kneading the bread with one hand while stirring up science experiments with the other. More often than we would like to admit, our house is a mess, our kids' clothes mismatched, and our lesson plans an afterthought. I actually look at traditionally-schooled families with some measure of awe, amazed at their parents' ability to get everyone up and out the door, looking halfway decent, every morning. You think we're organized? Some of us are. Then there are those of us who homeschool in part because we don't want to manage the paper trail that comes with traditional schooling (cough, cough). Yes, homeschooling is hard. But so is traditional schooling. They are just hard in different ways. What we have in common is that as parents we are all trying to do what is best for our children. And no matter which way you look, that is one messy proposition. 3) If you have homeschoolers in your church or neighborhood, encourage your children to include them in activities, birthday parties, and the like. It's not just the homeschooling moms who can sometimes feel isolated, but their children as well. Children in the neighborhood or at church who attend school together are naturally drawn together through shared experience. 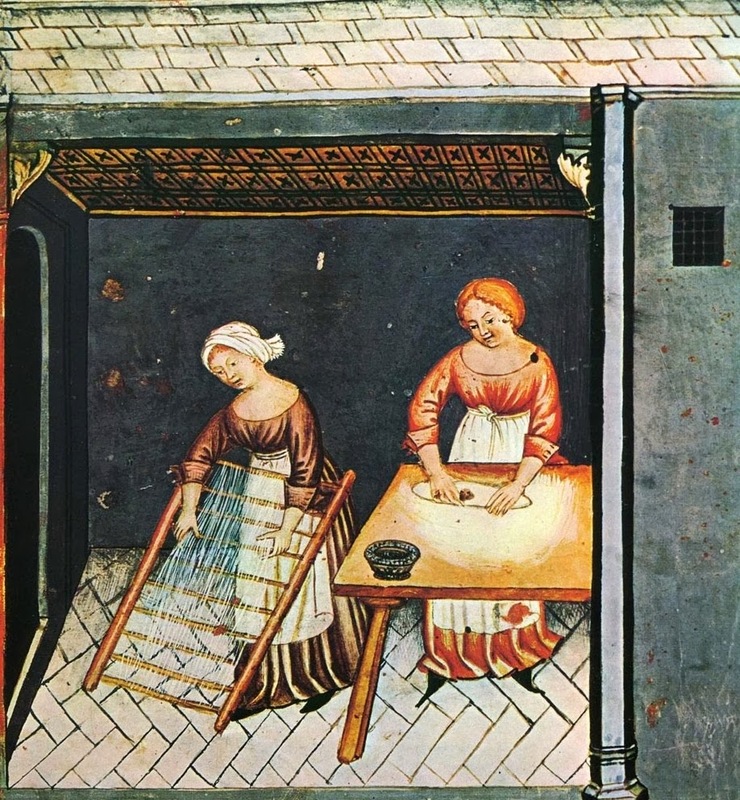 Homeschoolers are sometimes unintentionally overlooked or excluded. If you are planning an event or activity to which everyone in your child's grade is being invited, invite the same-aged homeschoolers as well. Such gestures are honey to a homeschool mom's heart. 4) Share your skills with us. If you are an excellent cook, seamstress, auto technician, carpenter, chess player, photographer, scrapbooker, computer expert or something else, you may find in one of our children a sponge that is thirsty for your expertise. When that happens, you may also find that sharing your passion with someone who is anxious to receive it motivates and brings you joy. One of my favorite things about homeschoolers is that they see teachers everywhere. 5) Be alert to opportunities that may be beneficial for your homeschooling friend or her family. That free tennis clinic you saw advertised in today's newspaper could be a gold mine for a homeschooling family who can't afford a tennis class. 6) Because most homeschool families live on a single income, they are often on a tight budget. If you have the means and would like to loosen your friend's budget buckle a bit, consider a donation to the cause. Ask her what her favorite homeschooling catalog is and purchase a gift card for it. Other possibilities are gift cards for her grocery store of choice, the local book or craft store, a favorite restaurant, or a family activity like bowling. 7) Offer to take the children (particularly younger ones) for a little while so your friend can have a break. Better yet, offer to watch them at her house so that she doesn't have to pack up and transport all their paraphernalia to yours! Then send her out with explicit instructions to pamper herself (and maybe slip a gift card to Starbucks in her hand as you shove her out the door). 8) Most of all, just be a friend. Ultimately, whether we as women homeschool or not, are married or single, have a large family or are childless, have a career or stay at home with the kids, we all want the same thing: someone to listen to us, someone to love us even when we aren't being very lovable, someone to gently tell us the truth when we need to hear it, and someone to point us to the Cross when we are having trouble even lifting our heads to look for it. While I think there are specific things each of us can do for our friends who find themselves in certain situations, the fundamentals of friendship don't vary much. A hug; a prayer; a pat on the hand; a smile; a shared tear; a sigh; a nod; and simple, knowing silence may go as far or farther than all of the suggestions above. In fact, sometimes the best thing you can do for your homeschooling friend is forget, for a while, that she's a homeschooler. I love this article! Thank you so much for your insight on the issue. I was wondering what homeschool program you use? I am considering homeschooling our two daughters, but it's becoming overwhelming to try to find a worthy program that isn't overpriced or lacking in some significant way. There are so many programs available nowadays and I'm becoming discouraged. I would greatly appreciate your input. Thank you in advance! Mary, so glad you liked the article! To answer your question, I don't use any one program. I have been homeschooling for 18 years now and over that time have used a variety of materials. I am what as known as an "eclectic" homeschooler. At times we are more structured, at times less so. Some of my favorite publishers, though, are Saxon and Teaching Textbooks for math, Apologia for science, and Sonlight for history and literature. I have also used some of A Beka's materials. If you want to read more about what we have done I have a number of homeschooling posts on my personal blog, www.roundunvarnishedtale.blogspot.com. Hope this helps!